Tetris 99 is a killer app for Nintendo's Switch Online service as well as the Nintendo Switch itself. A killer app is a piece of software that is so good it can sell you on a new system / platform all on it's own. Well, Tetris 99 did that for me. The Zelda: Link's Awakening remake announcement certainly helped, but I bought a Switch for Tetris 99 and I couldn't be happier with that decision. Continue reading after the jump for a little more discussion about Tetris 99. Tetris 99 is available for free with a Nintendo Online subscription. Nintendo Online costs $5 per month or $20 per year and allows you to play online multiplayer among other benefits including access to 30+ classic NES games. 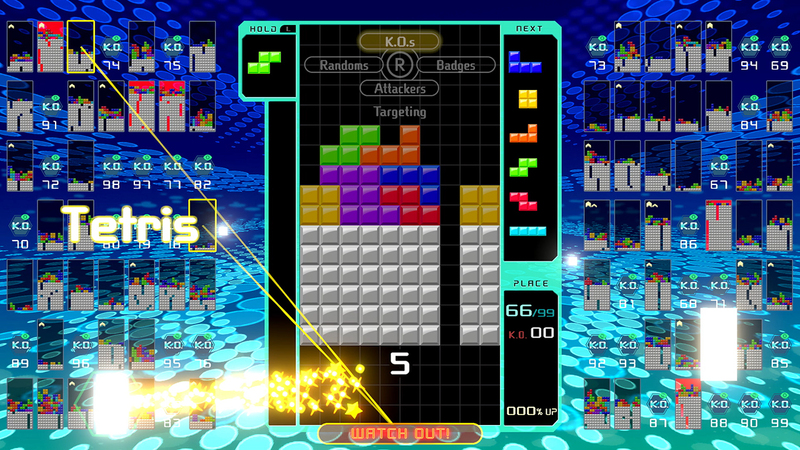 Tetris 99 is a multiplayer "battle royale" game where you compete against 98 other players in an elimination game of Tetris where the last person standing wins. The idea is that when you clear lines on your board they are dumped onto another player's board as junk lines and when a player's board reaches the top, they are eliminated. You can choose who to attack - either directly selecting a player or letting the game decide who to attack randomly or you can attack current KO or badge leaders or even counter-attack players attacking you. There are lots of ways to clear junk lines before they actually appear on your board and there are some different strategies involved around who and when to attack, so the game is a lot deeper than most folks suspect. 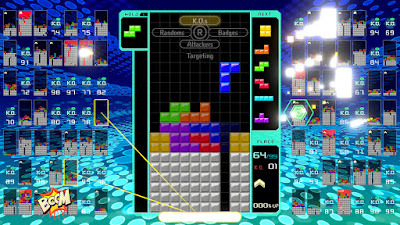 What I like about it the most, though, is that it is still pure oldschool simple Tetris at its core. You can play bare minimum meat and potatoes Tetris - just worrying about your own board and not even doing anything like t-spins or other advanced techniques - and not just survive but win fairly often as well. I love that. The game never gets all that fast until the very end of a round with the last 5 or so players, but it is never reaches extreme speeds like you see on AGDQ Tetris showcases. As long as you can deal with a little speed and have a plan on how to dig yourself out of trouble winning in Tetris 99 isn't too difficult. There is also a fair bit of randomness and luck involved, of course. In typical Tetris fashion you never seem to get the pieces you really need when you actually need them, but that is to be expected. Likewise, from one match to the next you never know what the other players are going to do. Sometimes it feels like a bunch of players gang up on you. And sometimes you coast through to the top 10 seemingly without anyone noticing. It's still "just" Tetris, but every match plays out differently and it is always a thrill. The best part is that the games only take a few minutes each so it has a really great "one more match" feel to it. It isn't like shooter battle royale games where you run around for 15 minutes and never see anyone and then someone you didn't even see shoots you from a mile away making you feel like you wasted all of your time. In Tetris 99 you get in and out of games ridiculously quickly and the matches themselves are lightning fast. That is important because it might take you a while to "git gud". I think it took me 40 matches before I won my first one but I came close many, many times and had a lot of fun doing it even if I wasn't winning. Once I figured out a strategy that worked for me, however, my winning percentage is much higher. Now I actually expect to win and do about 1/3rd of the time, which I think is pretty good considering the randomness noted above. Most importantly, I'm having FUN win or lose. TL:DR - I bought a Nintendo Switch because of Tetris 99 and I love it.